Aside from a notoriously eventful private life, Jeremy Thorpe – whose death was announced yesterday – endured a run of perilous election performances unique for the leader of any UK political party since the second world war. 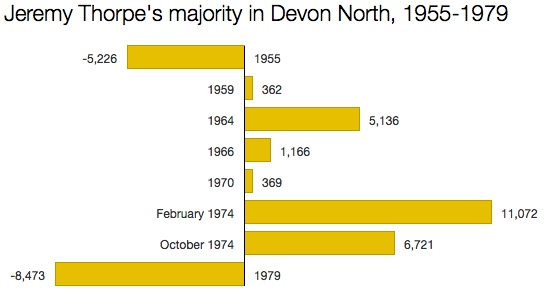 Devon North was a truly safe seat for only eight months of the 20 years it was held by Thorpe. For the rest of that period, the constituency shuttled between being one of the Liberals’ moderately safe toeholds and the party’s most marginal seat in the country. What I find particularly remarkable is the period 1970-74, when Thorpe was leader of his party at the same time as having a majority of just 369. No MP with a majority anywhere near as tiny as that would have a chance of either becoming or remaining leader today. And it wasn’t the first time Thorpe had dodged defeat. His debut election win in 1959 was thanks to a similarly miniscule majority of only 362. He turned this into a slightly more comfortable 5,136 in 1964, only to see it slump back to 1,166 two years later. This was no bar to him becoming Liberal leader in 1967, however. Neither was 1970’s tissue-thin majority of 369 bad enough to see him step down or be forced out. Reflecting his party’s dramatic rise in popularity in the early 70s, Thorpe’s majority soared to 11,072 at the February 1974 election. Just eight months later this tumbled down to 6,721 and Thorpe’s hold on Devon North was yet again a little too flaky for comfort. His parliamentary career was bookended by two massive defeats, but neither occurred while he was Liberal leader. At the 1955 election Thorpe missed out on victory by 5,226 votes: enough to make it worth his while trying again next time. But in 1979, three years after resigning as Liberal leader, Thorpe slumped to second place, 8,473 votes behind his Tory rival Tony Spellar. It was a humiliation and his ashen appearance at the declaration of the result was one of the defining images of the 1979 general election. The Liberals took 13 years to regain Devon North, Nick Harvey finally defeating Spellar in 1992. Harvey has held the seat ever since, and his current majority of 5,821, plus his long service and loyal local following, ought to be enough to see him win again in 2015. Harvey’s election performances since 1992 have been more consistent than those of Thorpe, but he has never managed to turn the constituency into a Lib Dem fortress. Aside from those eight months in 1974, Devon North remains one of those seats to which the Liberals cling rather than somewhere they dominate ruthlessly. Jeremy Thorpe’s legacy, at least in terms of elections, is that it is still a Liberal seat at all. It’s an interesting argument but I don’t really buy it. If Nick Clegg wins his seat by 300 votes next year, do you really think he would “step down or be forced out” because of it? He might very well step down or be forced out for a host of other reasons, but I don’t think the size of his victory in his own seat would be a factor. In politics, a win is a win, after all. I’m not sure that’s enough nowadays. A leader would struggle to command authority within their party and the media if they were seen to have barely got enough support from their constituents to hold their seat. Plus there’d be constant doubt about whether they’d be defeated at the next election, leading to non-stop speculation about a replacement, and so on. If Clegg ends up with a majority of 300, I reckon an attempt will be mounted to remove him as leader within a matter of months. Well, I guess we’ll just have to wait and find out next year. Who could be the most high-profile casualty at the 2015 election?